There are some fantastic markets all over the Costa Del Sol every day of the week. They can be great fun if you are here on holiday with all the usual latest crazes for kids and adults. They generally all sell the same stuff, but if you go to a market where there are more locals, San Pedro for example, you will find more stalls with flowers, fruit and veg, herbs and spices. If you go to Puerto Banus, that´s where you will get all the fake designer watches, jewellery, handbags and clothing as it is geared more towards the tourist. The Markets generally open at 9am, however, we did arrive at San Pedro market and hardly any stalls were open. They close around 2pm. Should it be raining, larger stall do have covers and will set up, some other stall holders may decide not to bother or call it day a bit earlier. In the summer it gets very hot, so don´t forget your suncream, hats and water. Mercadillos en Malaga is a fantastic website where you can check all the different markets everyday in the area of your choice and the exact location. You can choose which day under “Dia de Celebracion” and the type of market under “tipo de mercadillo”. You can also double check about markets by asking on the The Costa Del Sol Travel Forum. If you are looking for the main markets which sell everything then select Mercado Generalistas. It does get very busy, great opportunity for pick pockets, so watch your bag and pockets! As well as all the traditional Markets there are also some fabulous food markets all along the Coast, where you can buy fantastic fruit, veg, meat and fish, one of our favourites is in Marbella above the Car Park at the top of the Old Town, but you will find these in all the areas along the Costa Del Sol, just ask any local. Another one we found was in Malaga which was amazing. The fish was presented beautifully and looked so good you wanted to buy, take it home and cook it. They really do display all the produce in a stunning way where its almost like a piece of art. The variety of fish, shellfish, meats, poultry, fruits, vegetables, herbs and spices was unbelievable, produce you just don’t seem to find in the shops here. It´s not particularly cheap but definitely well worth it. You can see more photos of the Malaga Food Market here. Our first experience of one of these Markets was in Madrid, called Mercado San Miguel, very close to the Palace. If you are ever in Madrid, it´s well worth a visit. 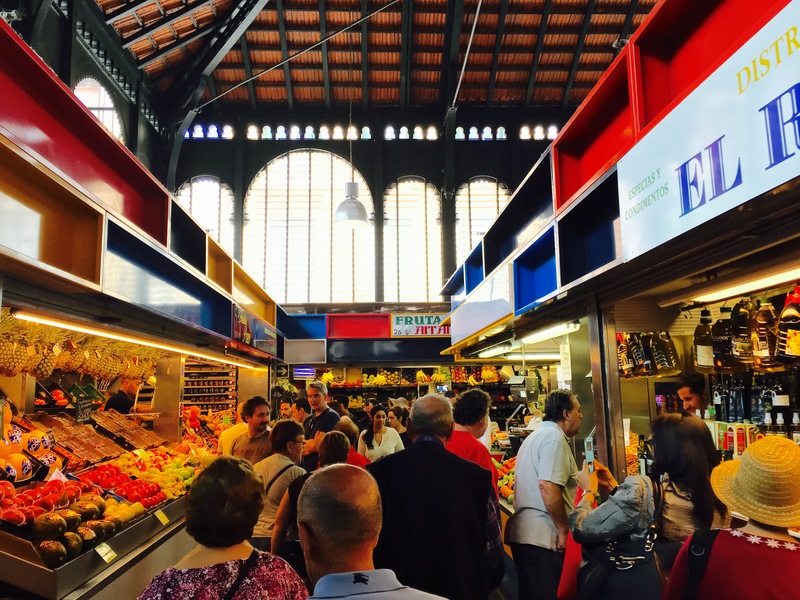 A huge variety of food stalls to choose from and the choices of wines, cheeses and olives is incredible. At the fish counters you can choose your fish and they will cook it for you right there in front of you. Whilst on the subject of Madrid you should also give Platea a visit. 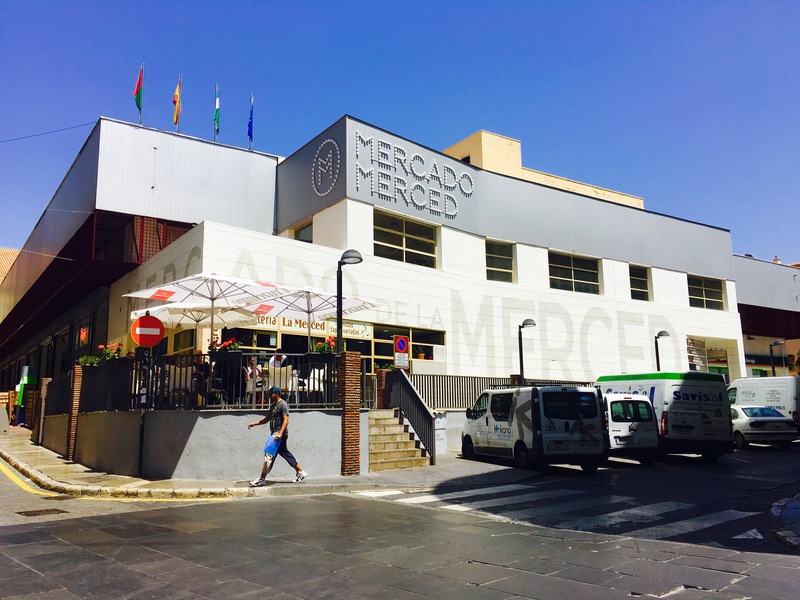 In Malaga we have one called Mercado Merced which is in Plaza de Merced. We really liked it here and it´s perfect when you all fancy something different to eat. You can choose from sushi, burgers, hams, cheeses, croquettes, paellas and lots more but you all sit in the same place where you will be served drinks from the bar. There is also another new food and drink place in Marbella called Abastos & Viandas. Located just to the right of Mango on Ricardo Soriano in Marbella. A nice place to take a glass of wine with a mix of food to choose from. If you have any of these good and drink markets in your area please let us know. For all other shopping you have Plaza Mayor in Malaga, close to the Airport, Miramar Centre in Fuengirola, La Canada in Marbella, Marina Banus in Puerto Banus and of course all the El Corte Ingles Stores along the Coast.